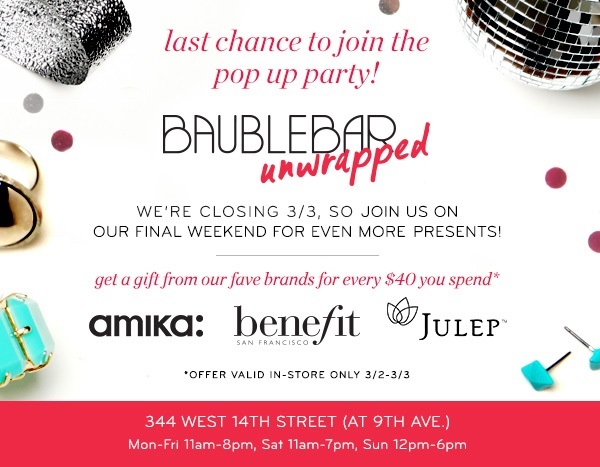 It's the final weekend to shop at BaubleBar Unwrapped, as the pop-up shop closes on March 3rd. All customers who spend $40 and over this Saturday and Sunday will receive a gift with purchase. Gifts will include either hair products from Amika, samples from Benefit Cosmetics or Julep nail polish, while supplies last! I had been looking specifically for rose gold jewelry, and BaubleBar Unwrapped had a great selection of earrings, bracelets and necklaces! If you can't make it to the pop-up, you can shop online at baublebar.com.